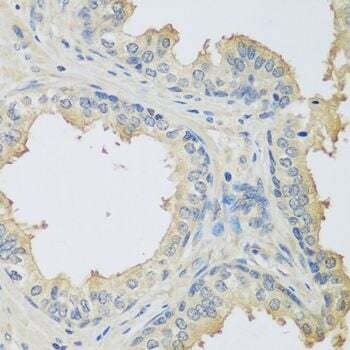 Immunohistochemistry of paraffin-embedded human prostate using C3 antibody at dilution of 1:100 (40x lens). 1. 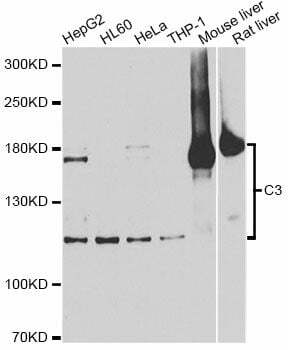 Pra1 targets C3 by cleaving C3 at a unique site. This inhibited effector function of the activation fragments. The newly formed C3a-like peptide lacked the C-terminal arginine residue needed for C3a-receptor binding and activation. Pra1 also bound to C3a and C3b generated by human convertases and blocked their effector functions, C3a binding to human C3a receptor, C3 antifungal activity, and C3b deposition.